41 players have survived to Day 2 of the Sydney Champs Main Event. 8 hour levels were completed. Chip leaders include Martin Rowe (146,525) who is well ahead of Peter Skouteris (98,025), Daniel Laidlaw (97,650), John Caridad (91,950), Karam Bahi (73,225) and Tyron Krost (71,850). Other notables include Phillip Willcocks (57,950), Martin Williams (56,725), Jonno Karamalikis (48,925), Andy Lee (40,025), Brendon Rubie (27,800) and Kahle Burns (24,200). Join us later today for Day 1 Flight 2 coverage from The Star in Sydney. Play begins at 12.30pm. Another player has been KOed so 49 players remain in this flight with just over 30 minutes remaining. 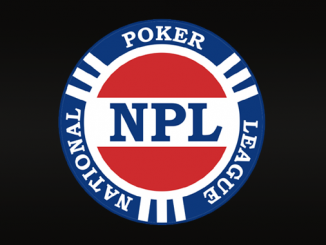 Notable chip counts include Martin Rowe (leader) 125,000, John Caridad 100,000, Daniel Laidlaw 78,000, Tyron Krost 52,000, Phillip Willcocks 53,000, and Andy Lee having dropped to 45,000. Level 8 has commenced. Blinds are 400/800 with an ante of 75. 51 players remain of the 88 that started tonight’s flight. It’s been announced that we’ll be completing level 7 AND level 8 this evening. Therefore, we have another hour and 15 minutes left, taking us to approximately 3.30am. Martin Rowe (pictured below) has steadily been gathering chips and is the 2nd player to break the 100k mark with 105,000 in chips. Martin is seated with Jason Gray, Dean Yuen, Brendon Rubie and has now been joined by Tyron Krost. John Caridad remains the chip leader with 115,000 in chips. John Caridad is keeping it exciting here at The Star with his aggressive play. He’s playing plenty of hands and is up and down like a yo-yo. He’s now crushed a few recent hands to be back at the head of the pack with 105,000 in chips, our first player to crack the 100k mark. Hold on tight, it could be a bumpy ride ahead. Level 7 has started. Blinds are 300/600 with an ante of 50. 61 players remain of the 88 that started tonight’s flight. Current chip leader Andy Lee (pictured below) with 80,000 is surrounded by a table of solid player. He’s joined by Jonno Karamalikis, Kahle Burns, Nabil Edgtton and early leader Xin Jie Lin. Jie Lin is fairing the worst of the lot though, hanging on with about 6000 in chips. We’ve reached the end of Level 6 and the players are now on a 10-minute break. John Caridad has had the better of his table throughout the night, until recently. Once holding near 80,000 in chips, he’s a little over 50,000 now. He’s been considerate about it though, sharing his spoils with several players on the table, now just on a little self-induced break to re-focus. Was there once a mirror there? With the recent move of the poker room to the other end of the casino (The Darling end) the team at The Star has been busy making things look presentable for the tournament. We think they’ve done a great job! Thanks to some great thinking, the Sydney Championship 2013 banners (pictured below) have been well utilised: to cover the large mirrors that were surrounding a number of the poker tables. Mirrors surrounding poker tables … yes, a bad idea! We’ve just been notified that at this stage we’ll still be playing to the end of level 8 unless we lose about 20 players in the next 1.5 levels. The target number to progress from today’s flight to Day 2 is around 40 players, so we’ll see how the players deal with the current blinds of 200/400+50 and then 300/600+50 in the following level (7). To be expected, play has been progressing slowly. At the end of 4 hours play there remained 73 of the 88 that began the evening. We’re now into level 6 and 66 players remain. Clear leaders include John Caridad with 77,000 and Andy Lee who’s headed back up to 62,000. Andrew Hinrichsen has been a reasonably early casualty. We’ve also noticed throughout the night that Jason Gray, Brendon Rubie and James Obst have been part of excitement of this flight. That chip lead of Andy Lee didn’t last too long after he found himself in three-way action with Nabil Edgtton and tough Kiwi player Phillip Willcocks. With the board showing 5c-5d-9s-8h-9c for a world of possibilities with Edgtton stepping aside after the turn, Willcocks announced all-in and Lee folded to send the NZ player to almost 50,000 while Lee slipped to 40,000. The fourth level of the evening has just ticked over and players are enjoying a 10-minute breather. When they return, blinds will be up to 150/300 with an ante of 25. Andy Lee has already captured one major title here at The Star, and he’s made a solid start to the 2013 Sydney Champs Main Event. Winner of the Star Poker Summer Series championship trophy in 2011, Lee is the chip leader on 58,000 with Xin Jie Lin (56,000) and John Caridad (54,000) close behind. Lee maybe running hot, but no-one looks any cooler in the room tonight than Ryan McKay (pictured below). Providing the good folk from PETA don’t pay him a visit tonight, the local flopper is well placed midway through day 1A with a stack of just over 40,000. Play has entered the third level of the evening (blinds at 100/200) after the first break on day 1A of the Sydney Champs Main Event. The entry list has topped out at 88 players with 79 still hopeful of surviving the night’s play. The biggest stack appears to belong to Xin Jie Lin on 49,000 while Nabil Edgtton (34,000) and martin Williams (32,000) have both improved on their starting stacks. Play is still on schedule to run eight levels but may halt slightly earlier depending on the numbers remaining. The field for the opening flight of the Sydney Champs Main Event is up to 85, with some of the players spotted this evening including defending champion Dean Yuen, Andrew Hinrichsen, Jonathan Karamalikis, Kahle Burns, Peter Skouteris, John Caridad, Andy Lee, Nabil Edgtton, Fred Alam, Martin Rowe, Tyron Krost, Daniel Laidlaw and Ciaran Sharp. After the first 60 minutes of play, three players have been eliminated. Star Poker regulars will be familiar with the numerous moves of the poker room over the years, and there’s a new site for this year’s Sydney Champs adjacent to Rock Lily. At least players KOed from the tournament won’t have far to go to drown their sorrows! Through early play several staff have been madly running around handing out Sydney Champs hoodies (pictured) to all players. Players have been spoiled by them even trying to match sizes … only the best Star hospitality for this mob! Sydney Champs Main Event turns five! Welcome to PokerMedia Australia’s coverage of the 2013 Sydney Poker Championships Main Event, live from The Star in Sydney. The Sydney Champs are one of the newer events on the national calendar. Appropriately, it was Australia’s newest WSOP gold bracelet winner who won the first Sydney Champs Main Event title back in 2009 for $121,500. Having placed third in 2009, Milan Gurung went one better to place second but again fell agonizingly short of victory as Andrew Capelin won the second edition of the Sydney Champs Main Event and the first prize of $136,942. Errolyn Strang joined an elite club of female players who’ve captured a major Australian title when she won the Sydney Champs Main Event crown in 2001, pocketing $119,542. Last year, Dean Yuen earned the championship trophy and a payout of $127,133 when he defeated David Borg for the title. The 2013 Main Event marks a new era for the tournament, with the buy-in boosted from $1650 to $3000. Players will start with 20,000 in chips, with levels scheduled to run 60 minutes. There is one other day one flight scheduled, which will start at 12.30pm tomorrow (Friday).